Tomorrow’s Cantabile (also known as Naeil’s Cantabile) is an amazing “feel good” show, one that will linger in your memory and put a smile on your face for a long time to come. 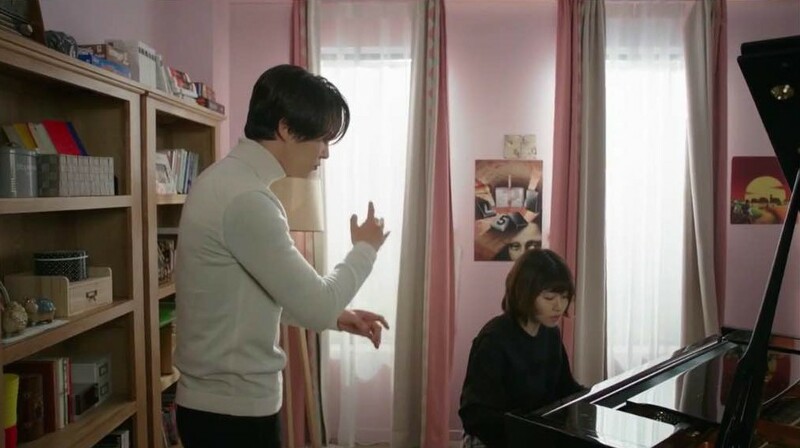 It’s one of a few Kdramas that have come out, recently, that deal with music as the background for the plot – My Lovable Girl, and Trot Lovers, both music related. But this one stands head and shoulders above the others. It has 16 episodes, which is just perfect, but I loved it so much I didn’t want it to end. Dragging it out longer would have been an awful idea, but it was still difficult to say goodbye to the whole thing. The story is about a musically gifted young pianist named Cha Yoo-Jin. His dream is to go to Europe and study conducting but he went through a terrifying incident on a plane when he was a boy and he’s scared to death to fly or get on a boat. So he’s kind of resigned himself to the fact that he’ll never leave South Korea. There goes that dream. Yoo-Jin is given a chance to conduct the school’s new orchestra comprised of the musical “misfits” – those musicians who aren’t skilled enough to be in the regular orchestra. But the school doesn’t have enough funds for two orchestras so which one will be dissolved, the one with the highly skilled students or the one made up of the kids who play with their heart? And we can’t forget the sweet, humble pianist Seol Nae-Il. She’s head-over-heels in love with Yoo-Jin and the way she follows him around is darling. Joo Won is, in my opinion, one of the best actors out there right now. He was stupendous in Good Doctor, taking home the Best Actor award from the 2013 KBS Drama Awards. His awards total 15 thus far, one for his roll in this drama! Amazing! Cha Yoo-Jin is a cute character – a hard worker who is a bit arrogant but very talented and supportive of those he loves. Shim Eun-Kyung is Seol Nae-Il. She was my favorite character in the show. There’s a little girl side of her she’s not ashamed to show, which is quite endearing. She has a big heart and her love for Yoo-Jin is deep, self-sacrificing, pure, and real. She’s an amazingly talented pianist with her own way of doing things. It’s her musical talent that finally has Yoo-Jin looking her way. Yoon was first offered the role of Nae-Il but I can’t picture anyone playing that part other than Eun-Kyung. Park Bo-Gum is Lee Yoon-Hoo. It was my first time seeing him perform and I was very impressed. He hasn’t been in that many shows yet, but he’s handsome and talented so I think he has a good future ahead of him. Yoon-Hoo is a famous cellist who is dealing with the knowledge that his career as a musician may have come to a painful halt. He is also enamored with Nae-Il. Ko Gyung-Pyo is Yoo Il-Rak, the leader of the “misfit” orchestra. He’s a good violinist but his skills just don’t measure up to that of the girl he likes, who happens to be in the rival orchestra. He has a sweet relationship with his father who adores him and supports him in his music. It’s very difficult to film someone playing an instrument they really aren’t playing and have it look real but the director chose great filming angles and the actors did a fine job faking it. There were times I wondered if the person they showed playing the instrument wasn’t actually playing it. That’s quality acting and filming shots. I was also impressed with Joo Won’s conducting skills, although I thought Park Bo-Gum did a much better job when he was conducting Mambo. The music of Beethoven, Tchaikovsky, Verdi, Brahms, Chopin, Dvorak, Liszt, Bach, Mahler, Haydn, Rachmaninoff, Mozart, along with so many others, can be heard throughout the entire drama. It’s a dream come true for classical music lovers like me. They’ve even thrown in a few non-classical bits just for fun, such as Bernstein’s Mambo from West Side Story and The Flatulence Song, way too funny. The scenery at the end of the show is amazing. It was partially filmed in Salzburg Austria which is a real treat for viewers. I can only recall a small handful of Kdramas that have filmed some of their show in Europe. So the fresh idea of filming in Austria was a great one. The buildings are so lovely. It’s a whole different look from the architecture we are used to seeing in Korean dramas. If you’re ready for a Kdrama that is upbeat, positive, and inspiring you won’t be disappointed with Tomorrow’s Cantabile.